They say in football the worst blindness is only seeing the ball, in medicine the worst blindness is only treating the symptom and yet modern healthcare systems have somehow sleep walked their way onto the edge of a dangerous precipice and unless we start ringing a few alarm bells, very soon, it’s heading for one almighty fall. All around the world health services are under an unsustainable load, an ever increasing stress and strain of Sisyphean proportions, from the welter burden of chronic diseases like; diabetes, heart disease and dementia, to the heavyweight of them all, cancer. Demand for healthcare far exceeds supply and as far as I can see the predictions are this will continue ad infinitum, until we all go broke and the last one out has to switch off the lights. And if truth be known, it’s a tragedy of our own making because we’ve fallen for the oldest trick in the book, the shoulder tap diversion, the something on your shirt misdirection rouse that the modern day health service has evolved into. Whilst most of our resources are directed towards the problems of illness and symptomatic relief, we have lost sight of what makes us healthy as individuals in the first place and fail to notice that the solutions are much closer to home and achievable than we care to imagine. The great irony of course, is that as individuals get sicker and sicker, the healthcare companies, food companies and big business in general get healthier and healthier, at least in terms of profits, and we are paying for their privilege. We need to turn this game around and start managing our own body’s, in the same way a successful business would manage theirs. Because in reality, that is what we really are, a super organism with many different components that collectively work together for the good of the whole company. 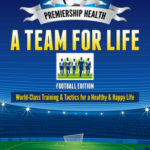 In Premiership Health, I have chosen a Football Club as my preferred analogy, because I believe it reflects every aspect of our lives, from the boardroom battles in the mind, to the fitness sessions in the gym, from the dietary tactics we choose, to how we take care of the fans, from the building and maintenance of our stadia, to the medical professionals we consult when injured. Each part of our “Super Club” each of our “Teams for Life” needs to be carefully managed if we want to see positive results and improve how well we play. This then is a “Wellness” model for health which attempts to address the root causes of disease and prevent them from happening with lifestyle and environmental interventions. The game becomes a whole lot simpler once you start playing it with your eyes open, with a clear direction and purpose, heading towards goal. Play well, get your Teams in shape and take care!